Before railroads were invented, goods often traveled along canals, with mules pulling barges from the bank. 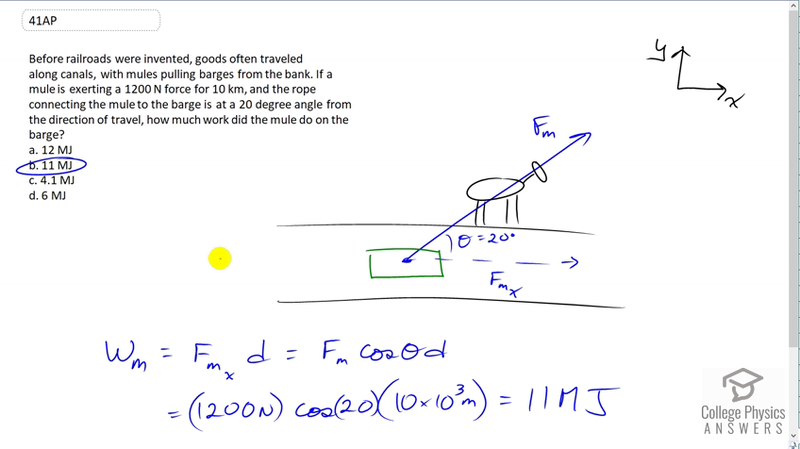 If a mule is exerting a 1200 N force for 10 km, and the rope connecting the mule to the barge is at a 20 degree angle from the direction of travel, how much work did the mule do on the barge? This is College Physics Answers with Shaun Dychko. The mule is on the side of the canal and is pulling this barge at an angle of 20 degrees with respect to the direction of motion. We need to find the work done by the mule, so that's going to be the component of the mule's force that is along the direction of motion multiplied by the distance traveled. So that's F m times cosine of theta because this is the adjacent leg of this right triangle. So we go cosine of theta times the hypotenuse to get the component that's horizontal and then that's going to be 1200 Newtons times cos 20, times 10 kilometers converted into meters. This gives 11 mega joules which is answer B.